It is with sadness and a heavy heart that I have learned of the death of our dear friend Donald Winter on Saturday April 5, 2014. 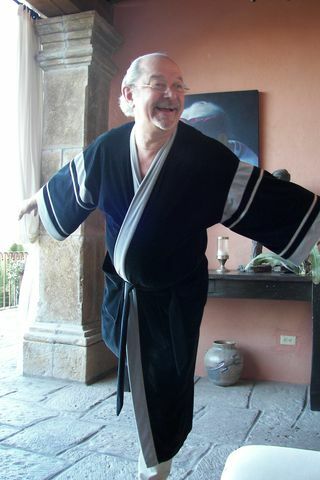 Donald suffered a heart attack and fell on the front stairs of the inner courtyard of his home, “Casa Corazon de Leon” in San Miguel de Allende, Mexico, he was 72. My Husband Leo and I last visited with Donald in the winter of 2010 enjoying the great treat of his lavish hospitality and beautiful home . We were shamelessly pampered by Donald and his staff who went out of their way to make us comfortable and welcome. Donald entertained us with dinner parties at Casa Corazon, introducing us to new friends while we all enjoyed Senora Josafina’s delicious dinners . Another treat was to visit with several of Donald’s San Miguel friends at their homes around town where we got to know some of the locals even better. During our stay Donald took us to his favorite historic sites, galleries and private artists’ studios as well as the big food and staples market where Leo and Donald indulged in purchasing a hefty load of delectable Mexican goodies. We were lucky enough to be In San Miguel for Allende’s 200th birthday. Allende was the general and one of the early martyrs of the revolution of 1810. Every day another celebration paraded through town and we saw horse guards in period uniforms, mounted charro families. Both riders, men and women as well as their horses were costumed in elaborate traditional garb including a lot of silver and tooled leather There were marching platoons in festive uniforms, marching bands, carriages with beautiful ladies in period costume, fireworks at night and much more, Wow! This was the life Donald enjoyed and generously shared with us, his family and other friends from around the world. When a sophisticated man of the world retires from an active career of service to non profit cultural and medical institutions at the venerable Law firm of Palmer and Dodge in Boston, where does he end up? 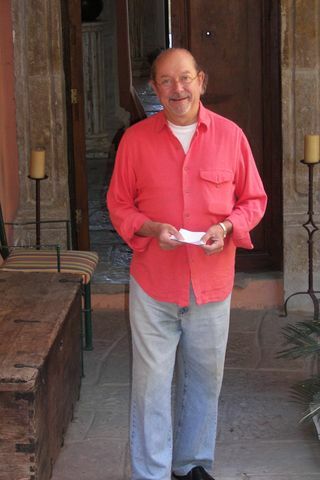 Our dear friend Donald Winter has chosen to put down roots and flourish in the exciting international town of San Miguel Allende, Mexico. 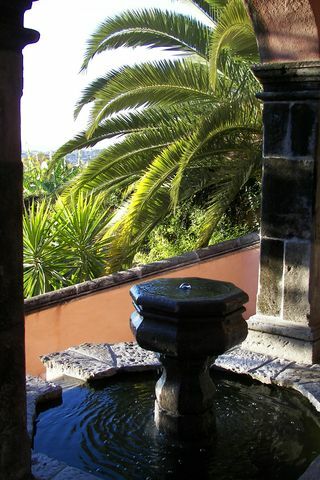 Tucked into a wrinkle of the Central Sierra Mountains in the semiarid state of Guanajuato two generous springs nurture an old Colonial town where time is measured by centuries. 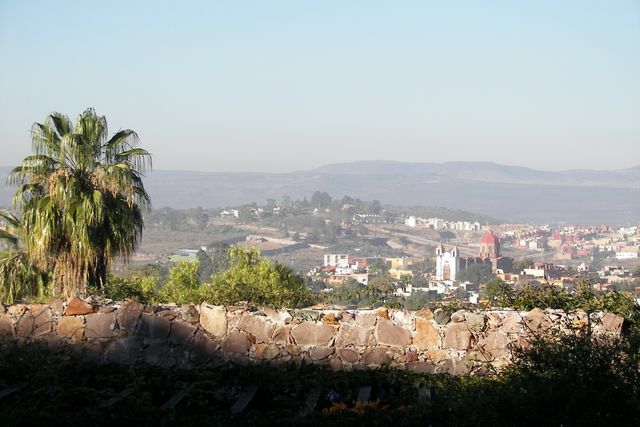 This is the historic town of San Miguel Allende. The original Spanish settlement in this area was founded along the Laja River by Friar Juan de San Miguel in 1542. 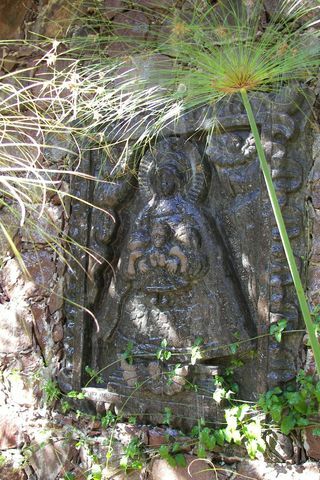 Friar Bernardo Cossin was designated to head the new Franciscan settlement there and he diligently struggled over the years to convert the indigenous people to Christianity. But these fiercely independent nomadic people, known collectively as the Chichimecas, attacked and burnt down the settlement in 1551 forcing the Franciscans to relocate to a higher more easily defensible location. Friar Cossin found a spot near by with two plentiful fresh water springs where he settled. He named this place San Miguel El Grande. During the Vicregal period San Miguel El Grande profited from being on the route from the surrounding gold and silver mining towns of Zacatecas, San Luis Potosí and Guanajuato to the capital of Mexico City. Also vast land tracts were granted to the Spanish for the development of cattle ranches. 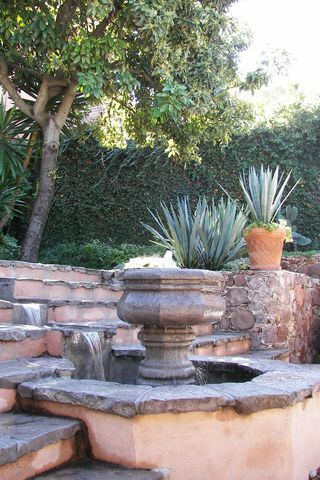 These income sources afforded the development of a prosperous town where wealthy families built impressive homes, Churches and government buildings that form the lasting cultural heritage of the present day San Miguel Allende. Ignacio de Allende was a native son of San Miguel El Grande He was from a wealthy and prominent family of that town. As a young man he joined the Dragoons of the Queen of Spain as a Lieutenant. In 1804 Allende’s company was mobilized to Mexico City and Veracruz to fend off an anticipated attack on Mexico by the English. During this campaign Allende had a change of heart and came to support a fledgling movement to gain independence from Spain. In 1808 he returned to San Miguel El Grande and attended secret meeting composed of a small core of intellectuals devoted to the independence movement. In 1810 issues came to a crisis and Allende and Father Miguel Hidalgo with a small band of followers began the war of independence from Spain in the small town of Dolores and then marched on to seize San Miguel. Allende became the first general of the insurgency but was apprehended and executed in 1811 by the Spanish. 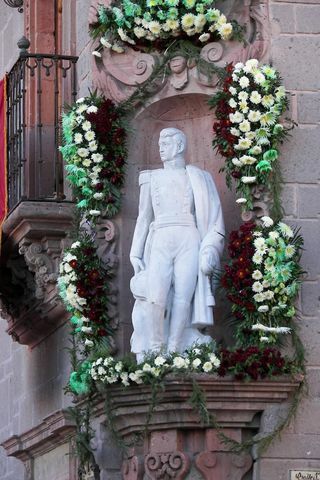 He is beloved by all Mexicans as one of the founding fathers of modern Mexico and San Miguel El Grande was renamed in his honor to be known as San Miguel Allende in 1824. In January of 2010 my husband Leo and I paid a visit to Don Donaldo Winter at his charming “Casa Corazon de Leon” where we enjoyed his abundant hospitality flowing freely like the refreshing waters of the local springs, “Batan” and “Izcuinapan” of the El Chorro neighborhood where the Franciscan Friars fist settled San Miguel El Grande. 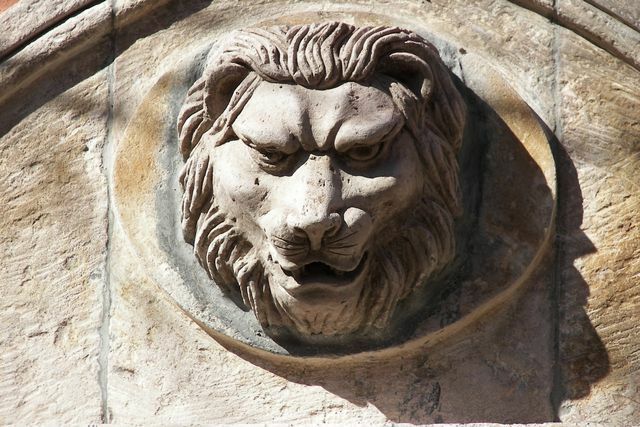 The smiling lion guarding Donald’s front door gives subtle reference to Richard di Frummolo, Donald’s beloved partner, “Richard the Lion Hearted” as Donald remembers him. Richard is now an angel looking down on the Don and his guests with mischievous glee. And like that monarch of fabled times Donald’s Richard was a conqueror too but not by means of war, rather by an infectious ebullient charm and unending creative energy. 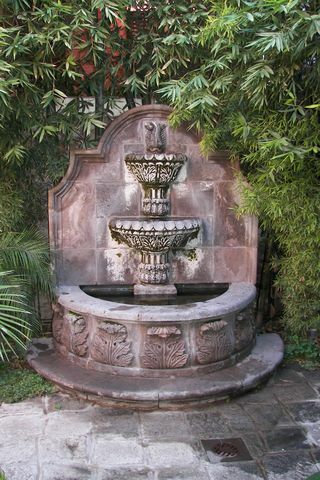 Although Richard never got to see the new house completed he is present in the constant flow of water from the various fountains that speak of the formless presence of a generous spirit. 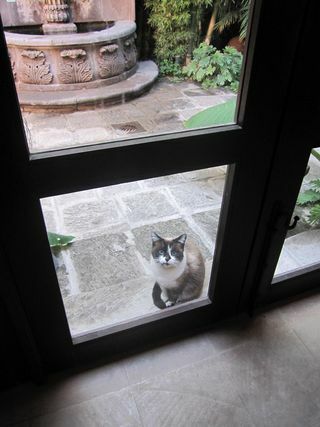 A neighborhood cat came by after the renovations, took a look around and decided, yes the new surroundings meet with her rigorous standards of good taste and requirements of spacious protected gardens so she settled in for the duration as the resident and reigning feline. My Husband Leo reads a fascinating book on Mexican crafts, one of many piled up on the living room coffee table. 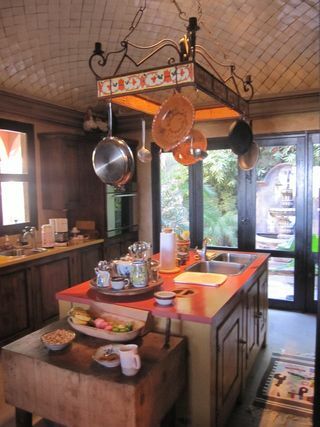 Behind him is the sturdy dinning table and comfortable chairs and behind that is the kitchen. 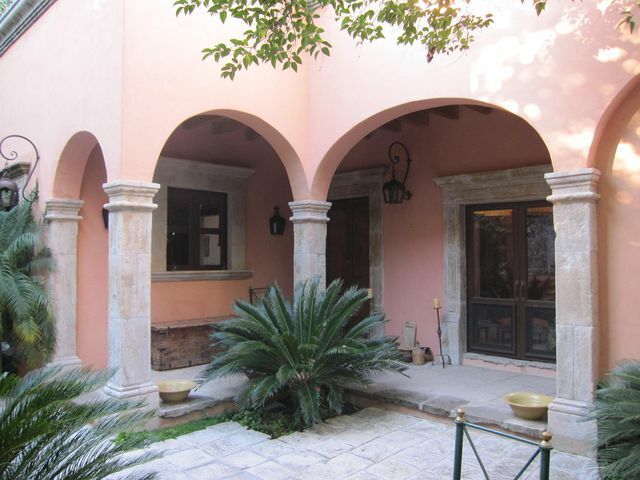 To the left is an antique double door which leads out to the front court yard beneath the colonnade as seen the above pictures. This magnificent room is made particularly impressive by the barrel vaulted ceiling punctuated by the oval bull’s eye window. The floor is paved with large quarried stones of irregular shapes and finished by broad marks from the mason’s chisel. 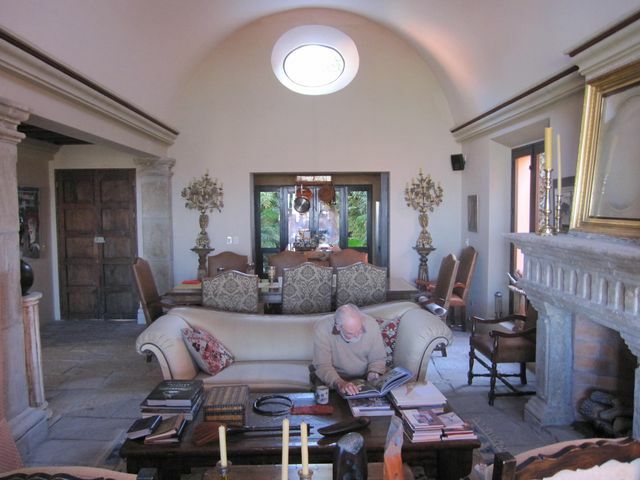 This is another view of the living room that runs the length of the middle section of Donald’s home. Leo is still captivated by his book. 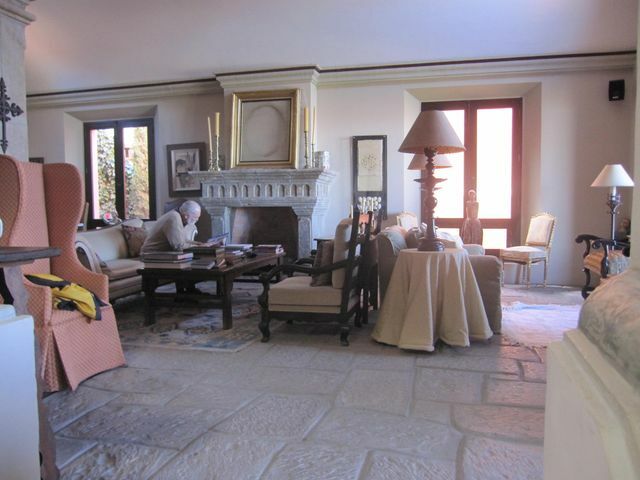 Looking across the dinning room table flanked by comfortably leather covered arm chairs we can see into the cozy study. 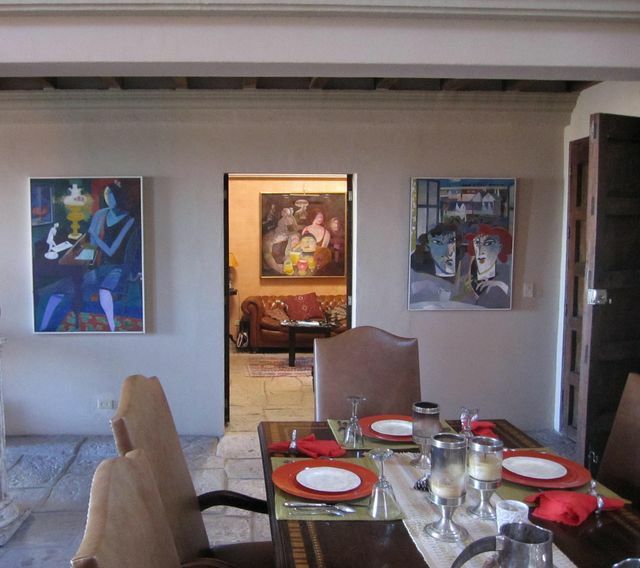 The trio painting here is a good illustration of how Donald’s art collection animates the subdued color scheme and handsome architectural components of the interior design of his home. The two friends depicted on the right seem to me to be particularly alive with the jangle of energy derived from the combination of strong coffee and a good gossip.The paintings are by Jim Giampaoli. Looking into the study, rich textiles used for the pillows and seating upholstery add a luxurious note to the room and the kelim rug echoes all these colors which are brought together by the subtle peachy tones of the walls. The zany painting by Keith Keller depicting café society in San Miguel gives an irreverent tone speaking of the meld of Mexican and Gringo characters one might find in the local late night Cantinas. Donald’s kitchen is nothing short of a miracle of functional design where several cooks can be happily at work at their own station and never get in each other’s way. Like the rest of the house the low key and serene interior architecture is warm and inviting. Note the traditional vaulted ceiling covered in hand-made off-white tiles that make rhythmic patterns dancing across the convex space. Out side the glass doors we can glimpse the fountain inspired by the one in the local library this gives the soothing trickle of falling water to further calm the atmosphere. 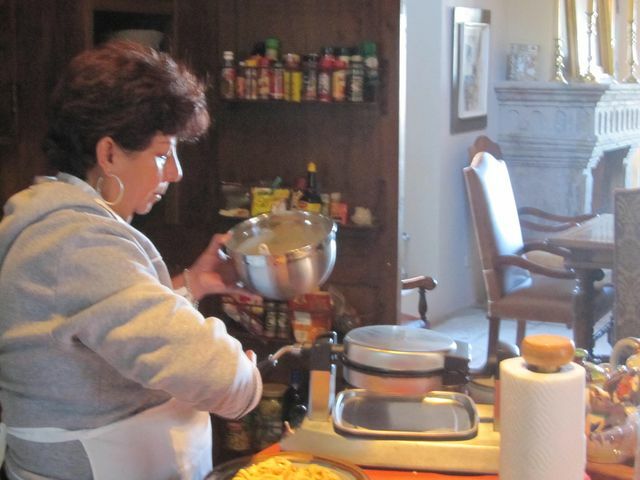 La Senora, Donald’s beloved housekeeper, Josafina, is here in the process of making waffles; a house specialty smothered in wild local honey and sliced fragrant strawberries the dish is irresistible. 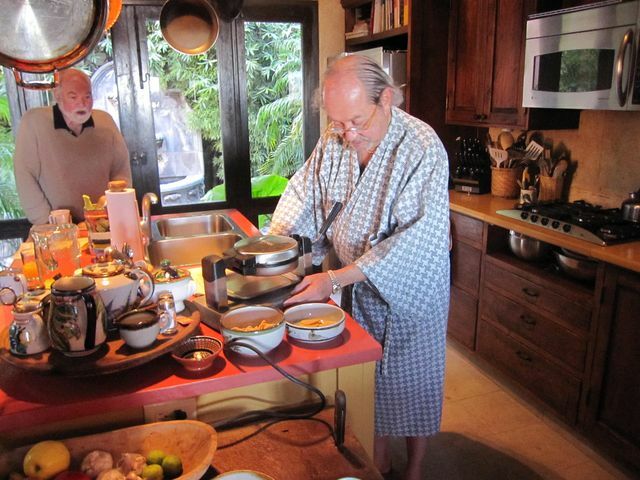 Don Donaldo’s dignity is enormously enhanced by his not standing on ceremony and pitching in the effort to produce a scrumptious breakfast in his comfortable bath robe. 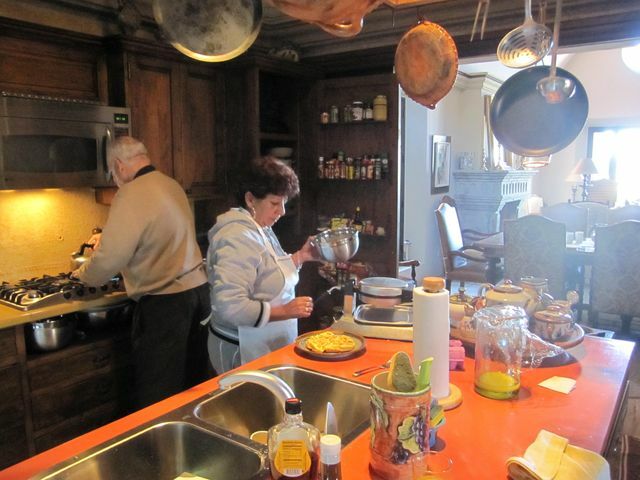 We were all very much “at home.” Leo is in the background getting ready to russel up some grub of his own concoction. Here Leo is diligently at work on his famous Chilaquiles, a tortilla, cheese, and salsa concoction that is a traditional Mexican breakfast favorite. Josafina admires her first waffles. 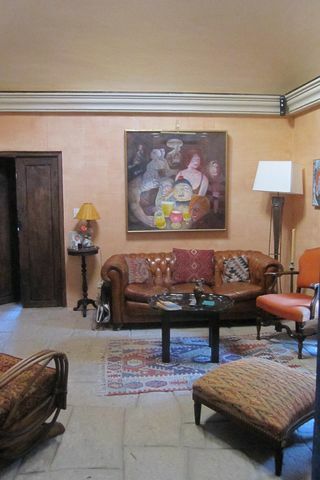 From this viewpoint we are looking out at the dinning room table and the fireplace of the living room beyond. 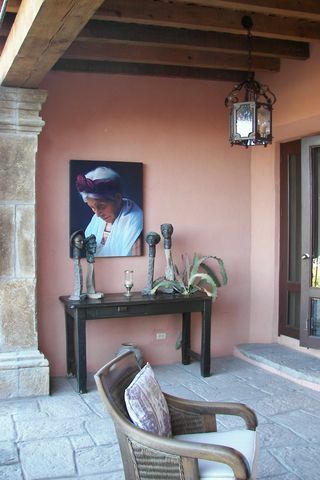 Every where one looks at Casa Corazon de Leon one comes across art, either paintings, sculpture, handy crafts or antiques of all sorts. 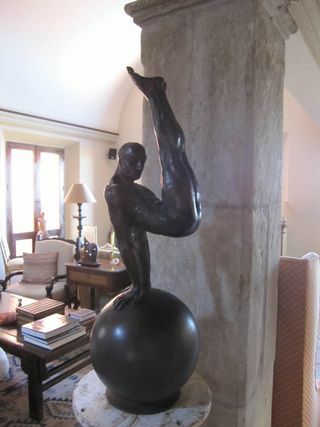 This sun-moon sculpture by the internationally renowned Mexico City artist Pedro Friederberg is a favorite of mine. 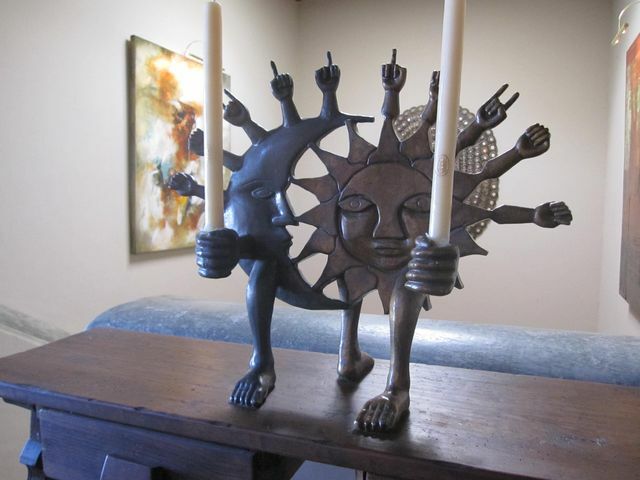 The many hand gestures remind me of those multi limbed deities of Hindu religious art and I find the opposing direction of the feet an amusing suggestion contrasting wills. This little honey sits on a side table at the head of a stone stair case leading down to the guest suites and the sunken garden at the rear of the property. 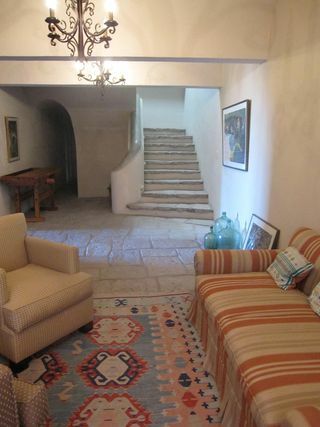 And this is the comfy sitting area at the bottom the aforementioned stairs. 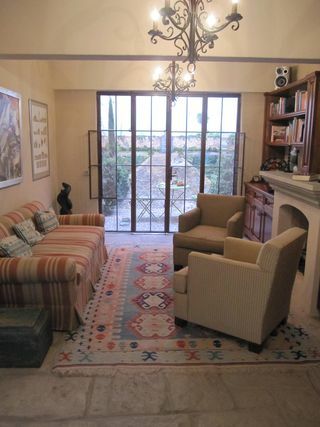 This room is on the level of the guest suites and gives guests staying at the house there own place to read and relax. Looking at the same “library” space from the stairs we see a vista out the window to a garden of pure fantasy which has gotta be the true delight of the home. In Mexican homes, restaurants, Inns and hotels song birds are kept in well crafted cages often woven in bamboo in fanciful shapes and many different sizes. These charming family members brighten the house with their chatter and melodies. Here at Casa Corazon, Don Donaldo has taken this tradition to new heights. 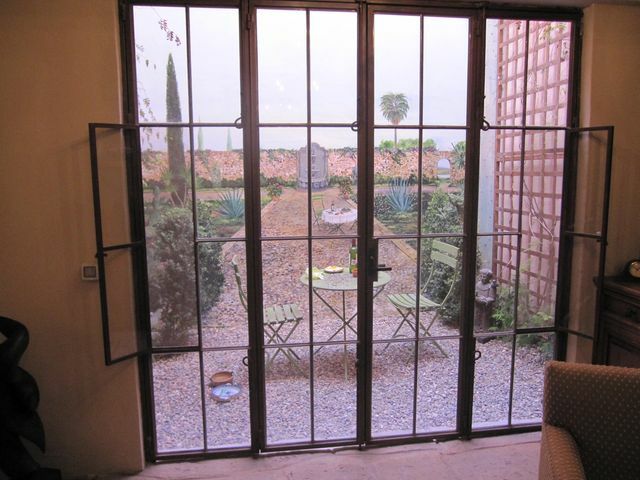 The “garden” beyond the glass doors is actually an aviary where a collection of small colorful birds flit about in their two storied spacious home with a completely convincing trompe L’oeil vista of a formal garden painted on the walls. The bird paradise with luncheon spread for the flock on the café table. 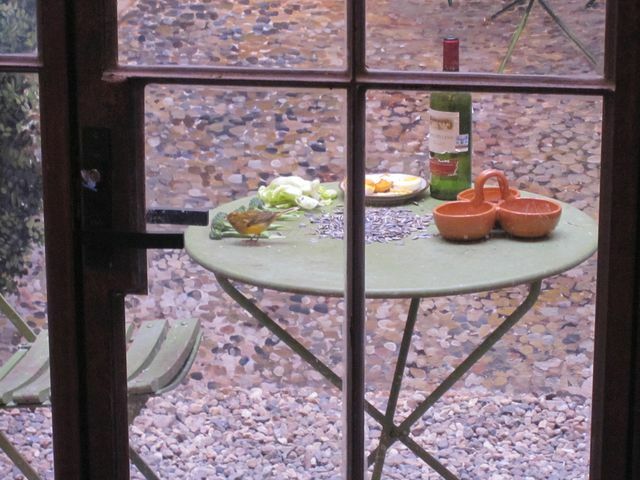 And here is a wee cheeper pecking away at sunflower seeds with dishes of fruit and vegetables on the table to provide variety for these epicurean enthusiasts. 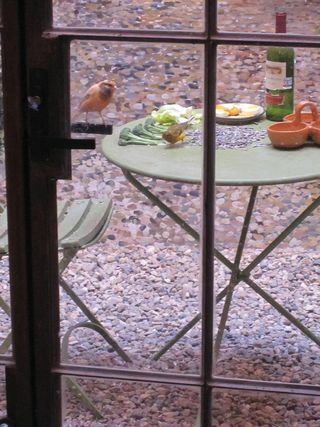 A delicate red-orange darling perched on the handle of the garden door inspects the day’s offerings. 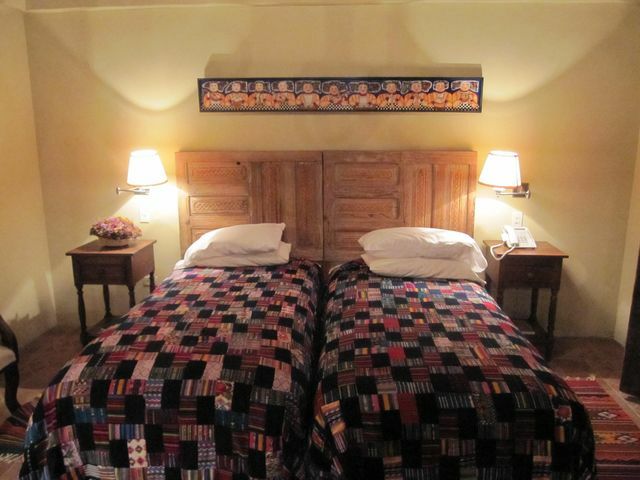 One of the guest rooms featuring twin beds with antique doors reused as head boards. The patchwork quilts from Guatemala are actually much more brilliant in color than my camera could capture. 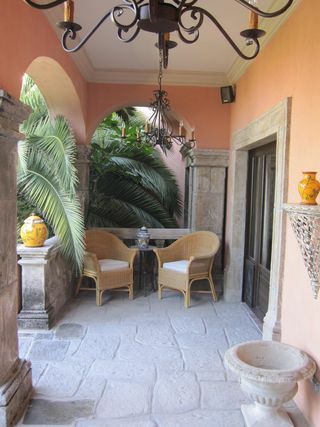 A quiet seating area beneath and arcade veiled by royal palm fronds. This comfy nook is located right out side the guest room pictured above. 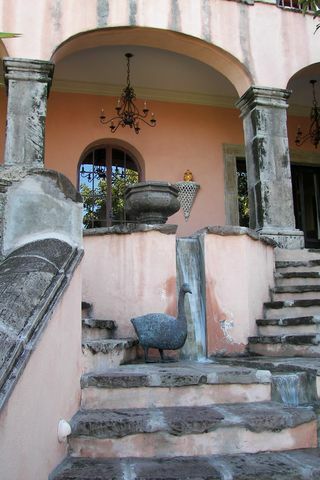 From the protected terrace out side the guest suites this fountain continues the theme of abundant water. 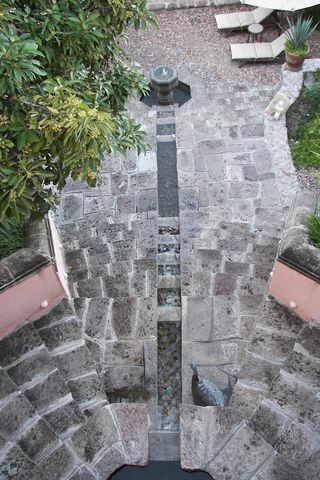 It is the basin that is connected by a water chase to another fountain below in the sunken garden. I love the bronze sculpture of the goose about to take a drink. 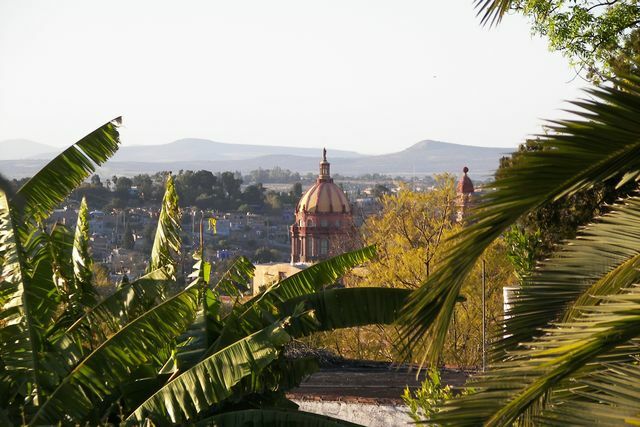 A pleasant view of San Miguel with a handsome dome of Las Monjas framed by banana and palm fronds with the Guanajuato mountains in the back ground. 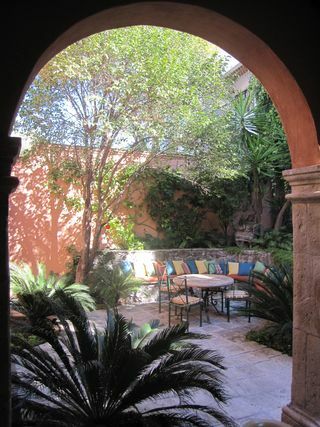 A cozy corner of the out door terrace where art and artifacts keep pleasant company awaiting visitors from far and wide. 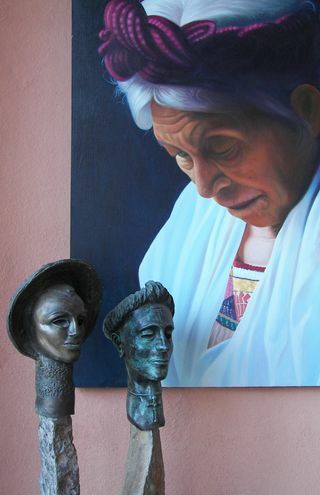 Another corner of the out door terrace with a meditative portrait of a traditional Mexican Senora de Oaxaca being protected by a collection of bronze busts by Rupert Getzen. Spurred on by my effusive bubbling praises, Don Donaldo expresses his soaring spirit with a gesture of joyous grace and delightful silliness. Such is the freedom of a wise man at home in foreign climes. 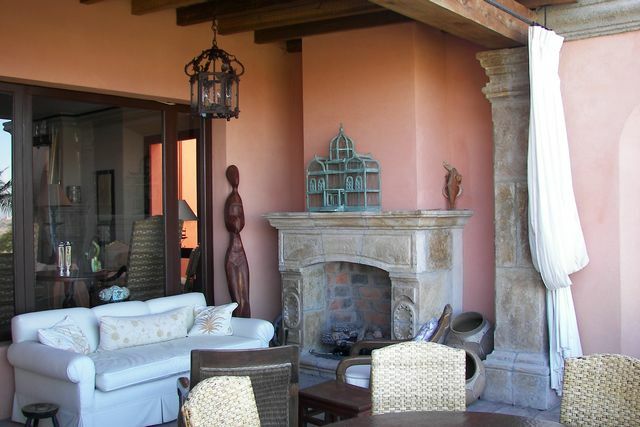 This entry was posted in Donald Winter in San Miguel, Homes of Creative Friends on April 15, 2014 by ioryallison3.